Even though women are barred from performing kirtan at the Golden Temple, but it is a team of women who now shoulder the responsibility of restoration of the fast deteriorating wall decorations within the Darbar Sahib. Hailing from different parts of India and belonging to different faiths, these women will soon bring these beautiful paintings back to their original glory. Known as fresco paintings, this style of painting is also called the “Sikh School of Art”. These paintings which adorn the main Darbar Hall and the walls of the staircases are done with natural colors and are renowned all over the world for the detailing and delicacy of the art. These frescoes were originally painted in 1830 during the time Maharaja Ranjit Singh took on the gilding of the Darbar Sahib. They were done by artist Giani Sant Singh along with many muslim artists. Again in 1910 Bhai Gian Singh Naqaash worked on them for 32 years. The third restoration was done in 1962 wherein varnish was used and this caused many of these beautiful paintings to deteriorate further. Namita Jaspal, working with her team of 6 other women, is restoring these magnificent paintings to their original glory. They are using scientific techniques to preserve these age old traditions and to save them for posterity. Detailing out the process, Namita says that first they will remove the damaged parts and then using a fine brush fill in the areas needing attention treating it appropriately. She is gravely concerned since much of the artwork from the staircases upto the walls is already in poor condition. The artwork is covering is almost 2500 sq.ft of space on the walls and 4000 sq.ft. space in the staircases. The women started working on the project in December 2013 and hope to complete this task in four months. The manager of the Golden Temple, Mr. Pratap Singh points out that the Golden Temple is the only unique place in the world where this style of art is still there. This time around, the SGPC plans to get it right and will cover the restored walls with a special glass covering. Next time we visit the Golden Temple we would do good to remember to keep our hands off these beautiful walls. Guru Hargobind wore the 52-tailed cloak on the day when he liberated 52 Hindu kings along with self from the Gwalior prison of Mughal emperor Jahangir and returned to Amritsar on Diwali, which Sikhs celebrate since as Bandi Chhor Diwas (day of liberation). Preserved at Ghudani Kalan, in Ludhiana, the relic was restored by the team of conservators headed by Namita Jaspal. Conservator Namita Jaspal working on the Chola Saheb Ji. Age-old religion, timeless art and irrepressible young artists are in perfect harmony for restoration work at the Golden Temple. These artists are breathing new life into many artforms that find a place at the Sikh shrine.Since the shrine is known as the Golden temple, the first and more prominent is gold-embossed work, found on all domes, the inner walls of Harmandar Sahib, and the door panels. Special designs have been given to copper sheets that are further covered by gold leaves. The other type is inlay work — beautiful designs depicting birds, animals, flowers engraved in marble, coloured and studded with colorful, semi-precious stones.The art is part of a centuries-old tradition. Architectural prototype of the Golden Temple came into being as an idea combining a dharamshala and tank envisaged by the fifth Sikh guru, Arjan Dev. Instead of building the temple on a high plinth, he had it built in a depression so that worshipper had to go down to pray at the Lord’s House.The 16th-century building was later repaired by Maharaja Ranjit Singh in 1802, an act commemorated by an inscription over the entrance to the central shrine. It was he who donated five lakh rupees for sheets of gilded copper on the roof. With time, devotees contributed too.For the latest work, it was in December 2013 that the Shiromani Gurdwara Parbandhak Committee (SGPC) hired a firm that tasked Chandigarh-based conservator Namita Jaspal, director and chief conservator at Heritage Preservation Atelier Private Limited, and her team with the project. Narrating the process, she said, “We have actually worked on the uppermost layer of the paintings — work done in 1960 by Atma Singh. First, some pre-consolidation work was carried out, and then came the cleansing process, which was done by dry and wet methods that were very mild and safe for the paintings.”She also shared with HT her assessment of damage and the team’s approach. “Conservation work for wall paintings and murals was started in December by my team members, who are from Leh, Delhi, Haryana, Assam, Chandigarh, Pune and Punjab. Initially, they worked on three broad categories of damage — first, the paintings that are hidden under stubborn layers of dark grime; then those that are varnished and hence yellowed; and also on paintings that are covered by glass.”About the consolidation process, she explained, “It’s done to fix loose layers of paintings. Material used for consolidation is compatible with the original material used, and this is also reversible. That means it can be taken out wherever required in future without damaging the original paintings.”All the processes and materials are in accordance with the international code of ethics of conservation, according to Namita. for hours sometimes. Since many of the works need refilling of paint, some of it is done with the use of injections too.Currently the in-painting process is being carried by a young team of students and lecturers, majority of them from Punjab. “We are purposely training young artists from Punjab so that in coming 5-10 years, if the restoration of art is needed again, these youngsters are readily available,” Namita said. Manjot and Mandeep Kaur added, “Working in the arches definitely gives us shoulder pain, cervical problems, as we have to keep are neck at a 90-degree upwards. The Idea: Restoration of artwork at Golden Temple was necessitated as visitors started pointing out flaking. Before 2013, too, it was done, but random painters or artists were called for it. Even some Rajasthani artists were invited but they tried to make new paintings and were stopped. Finally, SGPC planned to rope in professionals to basically work on the uppermost layer that was restored in 1960. The Target: “When we started, we knew how to stop the damage. Under ethics of conservation, within six months we have been able to do that,” said Namita. Talking about areas of focus, she listed the first floor specifically, “as it is all painted and was going through different types of damage”. The two main problems observed were: In the glass-covered areas, the paint was coming off and flaking was seen since dust was trapped inside the glass; in the varnished areas, brown patches had developed and cracks were spotted, according to Namita. Amritsar, Punjab: The restoration work on the interiors of the Golden Temple’s first floor is inching towards completion. Sources said the gold work had been restored on the walls and roofs of the ‘parikarma’. Now only arches were left. Similarly, restoration work is almost 30 per cent done on one of the staircases leading from the first floor to the second floor of the shrine. There are a total of three staircases, which take pilgrims from the first to the second floor. The restoration is to be carried out in two of these as there is hardly any artwork left in the third one due to ‘kar sewa’ carried out in the past. However, the work on the wall paintings as well as the gold work in the area where Guru Granth Sahib is installed on the first floor is yet to start. There are reports that the restoration work on the entire first floor is most likely to be over by December-end. The work had slowed down a bit in the festive season as there was a huge rush of devotees. At present, a team of seven conservators led by Chandigarh-based Namita Jaspal is working on the project. A special gold paint manufactured by a European firm is being used in the conservation work. It is 22 carat gold and 10 gm of this paint costs around Rs 1 lakh. The gold work inside the shrine had suffered damage with passage of time as well as pollution. It witnessed flaking and tarnishing at various spots. Besides, the gold work had also been painted with brown colour in a few areas probably during a ‘sewa’ performed in the past. The gold work is primarily on the roof and the arches of the holy shrine. In the first phase of restoration, the conservation experts had restored the precious art work on the walls of the first floor, which had infused a fresh lease of life into the wall paintings that regained their pristine grandeur. The paintings involved the most intricate work and it took the team almost six months for restoration. There was considerable flaking in some areas and artists were engaged to “reconstruct” the lost part of the wall paintings while taking a clue from the existing pattern. If art is an expression, painting propagates it. When an artist paints, he or she puts a portion of his heart out on the canvas. And so when appreciating art, it becomes important to preserve those feelings expressed in colours.”Anybody who appreciates art understands the importance of art conservation. Its an interesting combination of scientific and creative instincts,” says Namita Jaspal, an art conservationist from the city. Interacting with prominent museumologists, art curators and collectors; gallery owners and conservationists at a workshop held on ‘Conservation of Paintings and Archival Material’, she spoke on the theme of creating social harmony through art conservation. “There are many people working behind preserving a piece of art. There are curators, conservationist who work in their laboratories all day; the museum people who find and preserve art works of importance. Each has an isolated job but when combined it completes the process of art. Talking social harmony, I wanted to start from the museum itself,” says Namita. The book, “Painting: Techniques and Conservation”, released on the occasion, was also an example of that. “The book talks about various painting techniques right from the Paleolithic Era to the modern day. 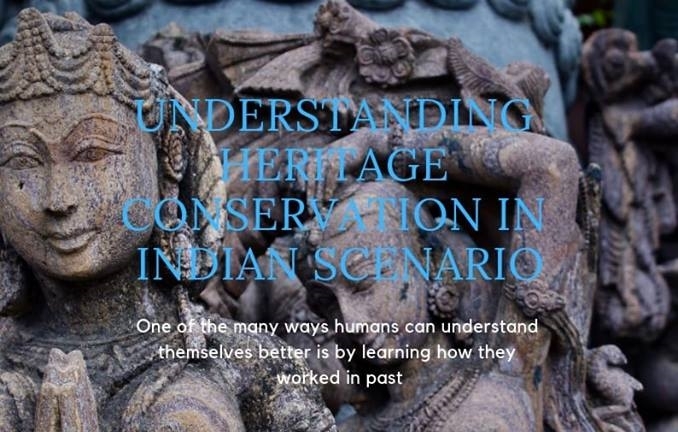 It has interesting elements like a conservationist giving detailed analysis of art techniques and an artist talking about conservation techniques.” Harmony in place indeed! Namita graduated from the National Museum, New Delhi, 12 years ago and has been restoring art works from across the region such as miniature paintings, silver work in murals and paintings by known artists. She has been able to successfully garner government aid for Singhoor Museum in Kurukshetra and Ferozshah Museum in Punjab. The sword with which once Capt Joginder Singh, a trusted general of Maharaja Bhupinder Singh of Patiala, fought many wars would have lain neglected in the attic of his grandson Hari Singh’s house in Sector 9, had it not been for the initiatives of the Government Museum and Art Gallery. Thanks to the museum director N P S Randhawa and his team members P. C. Sharma and art conservator Namita Jaspal, the sword is now being restored to its former glory. And Hari Singh, becomes the first lucky beneficiary of this week-long workshop on heritage conservation started by the museum on Thursday. Same is the case with the priceless painting of Golden Temple by S.G Thakur Singh, which was torn in the middle. The workshop title Heritage Conservation: Problems and Practice Codes come as part of the museum’s outreach activity which means the team members going door-to-door in a specially designed bus which is full of restored antiques with the aim to generate awareness among the masses. “All of us have some antique or other in our homes. Our aim is to point it out to them, bring it back from the storeroom or the dustbins and restore it in their rightful place. By doing that half of our job is done. If something needs professional touch, we bring it with us and restore it in our lab free of coast,” says Randhawa. A look inside of the bus is enough to awakened one’s love for antiques – a metal pension seal Buddhi Singh, a World War I hero, which is now as good as new, a couple of pre-historic spears again in metal which got corroded as apparently someone tried to find out which metal was it, a table clock with all freedom fighters statues for hour hands, a few handwritten farmans by Sikh rulers, a black and white poster of Bollywood film Apsara and three unique volumes of Census of India conducted in 1891 that gives out information even on caste creed and religion, visually and physically challenged people of the area as well as those who speaks English and those who do not. “Most damages occurs because people try to use adhesive or try to clean their metal artifacts with acids,” explains Namita, who has a master degree in art restoration from National Museum Institute and has been working as a freelance restorer for the past 13 years. “Restoration should be a reversible process and the materials used to do that should provide a protective layer to the object. But when people uses cellophane or fevicol type of thing they end up causing more harm to their antique,” says Namita. Well, the team is all set to breathe a new lease of life free of cost to anyone who approaches during this week. But if someone wants to learn the basics of art restoration, then there is a booklet that teaches one as how to go about it.